The Problem: Nesting turtles once had no trouble finding a quiet, dark beach on which to nest, but now they must compete with tourists, businesses and coastal residents for use of sandy beaches. United States beaches, popular among humans and turtles alike, are now lined with seaside condominiums, houses and hotels. Lights from these developments discourage females from nesting. If a female fails to nest after multiple false crawls, she will resort to less favorable nesting spots or deposit her eggs in the ocean. In either case, the survival outlook for hatchlings is slim. Lighting near the shore also can cause hatchlings to become disoriented and wander inland, where they often die of dehydration or predation. Hatchlings, scientists believe, have an innate instinct that leads them in the brightest direction, which is normally moonlight reflecting off of the ocean. Excess lighting from the nearshore buildings and streets draw hatchlings toward land, where they may be eaten, run over, or drown in swimming pools. While it might seem like a difficult problem to tackle, an estimated one third of all lighting in the United States is wasted. With an annual expenditure of about 30 million barrels of oil and 2 million tons of coal on unnecessary lights, the cost of the wasted lighting equals about $2 billion each year! 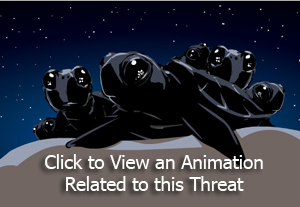 Species Affected: All species of sea turtles are affected. The Solution: Reducing the amount of artificial light that is visible from nesting beaches is the first step to reducing light pollution that affects sea turtles. Lights along the coastline need to be shielded, changed, or turned off during nesting season to prevent sea turtles from being disoriented. Coastal communities around the world have passed ordinances that require residents to turn off unnecessary beachfront lights and shield lights from reaching the beach during turtle nesting season. Unfortunately, these ordinances are not always enforced and do not address the larger problem of sky glow that occurs near cities. * Close opaque curtains or blinds after dark to cover windows visible from the beach. Case Study: At Gulf Islands National Seashore, approximately half the nests experienced a high level of hatchling disorientation. In 1999, 33 of 65 nests (51 percent) that hatched had levels of disorientation where at least 25 percent of the hatchlings emerging from the nest cued in on the wrong direction. In 2000, 26 of 58 nests (45 percent) that hatched were disoriented. This 6 percent reduction in just one year exemplifies how educating the public about light pollution can directly benefit sea turtles. Recently, the Boca Raton Sea Turtle Program began recording every crawl on hand-held GPS (Global Positioning Satellite) units. This technology allows researchers to track how many hatchlings emerged from the nest, the time of emergence, where on the beach the hatchlings are going, and identify possible sources of artificial lighting.